No1 Tile & Grout Cleaning Sealing & Recolouring is a complete professional sercvice focused on customer specific needs and concerns.Our service guarantees that your tile and grout cleaning will be completed by a trained and insured technician with many years’ experience. 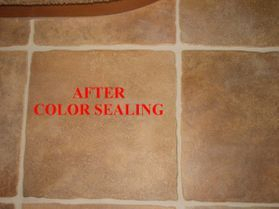 Our tile and grout cleaning with recolouring ensured your floors are at there best. 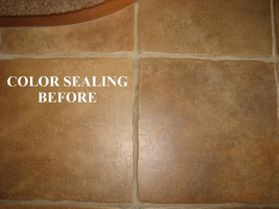 Grout Recolouring is an exceptional service adding year of life to your floor and makes easy cleaning. Much of our business comes from builders, tile installers and tile shops who call us in when other tile grout cleaners have not been able to clean tile and grout successfully. Do you have polished porcelain tiles? We use a microscrub product that cleans your tiles to remove the grime and old wax that other grout cleaners can't. Porcelain tiles requires delicate cleaning and handling as not to damage the surface with harsh cleaners and equipment. Call us on 0418987287 today for a Free Audit and Demonstration on Service!! This is a bathroom that has seen better days! We set out to clean the grout first and than remove old silicone and replace with new. Than followed with new grout colour revitalizing this tired bathroom. With all our services "we add value to your property"!!! 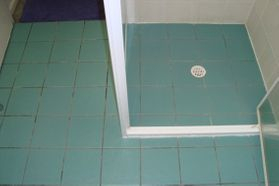 -Tile and Grout Cleaning= Several Step Process to ensure tile are cleaned to best potential. -Tile and Grout Sealing=We professional seal your ceramic and stone tiles making them easier to cleaning and prevent staining from occurring. if a treated area becomes stained with a material that cannot be removed by the client using a Approved Floor Cleaner neutral cleaner no more than ph 7, we will come back and treat the area and recolour it if required. SiliconeSeal Replacement=silicone replacement to shower area a and kitchen/wet area splash backs. Free with bathroom clean and recolour package. 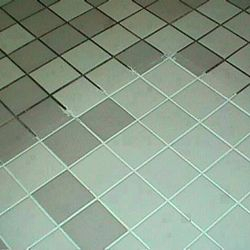 Grout Repair= Replacing missing grout in floor area/detailing poorly laid grout. 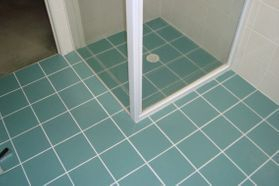 Tile Replacement= Replacing cracked tiles or re-fixing loose tiles in bathroom and floors. Shower Glass Restoration= Professionally restoring shower glass removing scum, build up ect and place a protector that will prevent staining and . Bathroom Makeover=Inspection,Cleaning of Grout,tiles, shower glass, removal of silicone seal, repairs to grout, replace with new silicone sealer, recolour grout and protect the shower glass. Kitchen Makeover= Inspection,Cleaning of Grout,tiles, splash backs, removal of silicone seal, repairs to grout, replace with new silicone sealer and recolour grout. 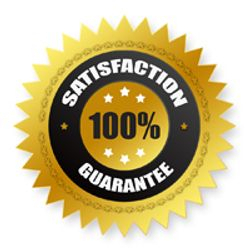 We conduct Free Demo of the service to gauge end results ensuring customer Satisfaction!! Porcelain Tile Clean and Buff. Heavy Duty Steam Grout Cleaning Unit!